Lock in a great price for La Calzada del Santo – rated 9.3 by recent guests! Great food top patio and small pool. Breakfast was great. Excellent Rooms, unique and great private rooftop with bar and pool! Breakfast was excellent and staff very good. Owners were there and took care of everything at any time. Location works well being closed to everything! Good location. You are half a block from restaurant row. Good breakfast. Great rooftop bar, soaking pool and lounging area. Best of all was our wonderful host/owners. Thank you so much for a very comfortable stay. Hope to see you again. Cheers! A/C, hot showers, a safe, the rooftop bar, and the friendliness of the staff. Great staff and excellent location. Always ready to help and support the guests. owner on site. 24 hr desk. great breakfast. pool on roof. super well kept. The staff was incredibly helpful arranging a trip to Taganga for us. The bed was comfortable, water was hot and strong, and ambience wonderful. I would definitely stay here again. it was everything FAAANTAAASTIC ! Frindly , helpfull, nice ! The attention to detail was superb. The owner was accommodating. We were able to leave our luggage there while we went for a 3 day tour, also provided breakfast at 4 am before we left to the tour I was impressed with the service from the moment I got to the hotel. The location was perfect, close to many restaurant in the historical section of town. La Calzada del Santo This rating is a reflection of how the property compares to the industry standard when it comes to price, facilities and services available. It's based on a self-evaluation by the property. Use this rating to help choose your stay! One of our top picks in Santa Marta.Offering a pool, La Calzada del Santo is located in Santa Marta, just 800 feet from the Cathedral and 650 feet from the Tayrona´s Gold Museum and Casa de la Aduana . This modern hotel features free WiFi and a roof top lounge with views of the city. Each air-conditioned room here is spacious and comes equipped with a flat-screen TV, a mini-bar and a private bathroom with a shower and toilet. They also include a mini-bar and a small wardrobe. At La Calzada del Santo you will find a 24-hour front desk and a shared lounge with a TV area. Guests will find restaurants and bars within a 5-minute walk of the property. The tour desk can help guests arrange a wide range of outings, with the popular Quinta de San Pedro Alejandrino located within a 5-minute drive. Simon Bolivar Airport can be reached in a 20-minute drive. 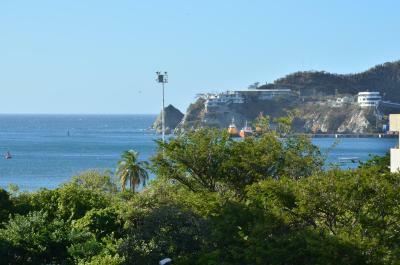 This property is also rated for the best value in Santa Marta! Guests are getting more for their money when compared to other properties in this city. When would you like to stay at La Calzada del Santo? This air-conditioned room features a wardrobe, a desk and a flat-screen TV. It also features a private bathroom with a shower and toilet. This air-conditioned room features a wardrobe, a desk and a flat-screen TV. It also features a private bathroom with a shower and toilet. There is a private balcony overlooking the city. This larger air-conditioned room features a wardrobe, a desk and a flat-screen TV. It also features a balcony and a private bathroom with a shower and toilet. House Rules La Calzada del Santo takes special requests – add in the next step! La Calzada del Santo accepts these cards and reserves the right to temporarily hold an amount prior to arrival. Please note that hotel Insurance is suggested. The value of it is COP 5000 per day, per room. This hotel was comfortable, well located and clean, but best of all was the service. The staff/manager at this hotel went way above and beyond the call of duty in his assistance to us. My wife had left one of her bags on the minibus from Cartagena to Santa Marta. Andres spent much time and was very persistent in his f/u with the bus company to try and get our luggage back, even after we left and went on to Minca. After several days of back and forth with the bus company he successfully located it. Only little point: AC was a little too loud to run at night. Everything was great: super friendly & helpful staff, perfect location, everything was perfectly clean and the hotel has a lot of cosy places. Would definitely recommend staying at Calzada del Santo if you're in Santa Marta! Nothing- this place was great. 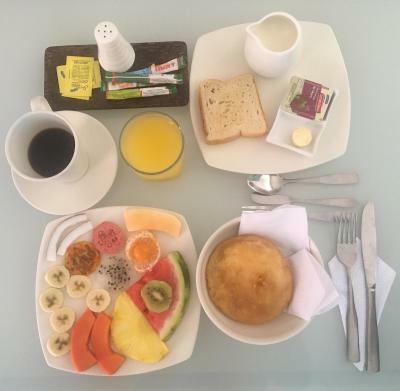 Super friendly and helpful owner - got laundry done during our 1 night stay, good tips on where to go for dinner and a great breakfast with lots of choice. We liked the rooftop bar, its breezy in the evening but a lovely spot for a beer or 2 at the end of the day. We had a family room which was nice and spacious. Rooftop bar was great, but the pool is very small. Service was nice! Good breakfast. Location right in the old town centre with a lot of bars and restaurants close by. The shower in our room was a minor issue since due to its construction it flooded the bathroom every time it was used. The staff is friendly, and the owner gave the Impression that he cared About every guest he had. There is a nice rooftop terrace with nice views of the City. Bathroom was open to the rest of he room, not a big deal but not to my liking. Some issues with the WiFi, the pool at the top was very small. I couldn't get the TV to turn on, but it wasn't that necessary. The breakfast was delicious! The location was perfect, we wanted to be near the outfitter and near restaurants and shops. I also liked the fact that there was a ceiling fan in my room with 5 settings, so I didn't have to use the air conditioning. I prefer a fan over air conditioning every time. The staff was super helpful and friendly. We liked the rooftop area to hang out and chat after dinner. 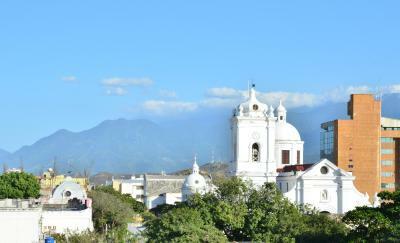 It was a great experience and I will stay there again on our next visit to Santa Marta. This hotel was such a pleasure to stay in. Great location, very comfortable, clean spacious room, very helpful and friendly staff who made our stay simply wonderful. 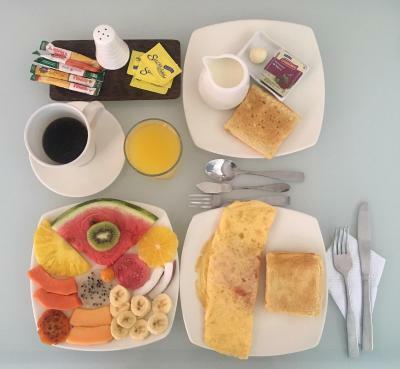 Breakfast was amazing with fresh fruits, tasty arrepas, eggs any way you want them, fresh coffee and juice. Would definitely recommend this hotel to anyone staying in the friendly town Santa Marta. I felt right at home at this beautiful place. Good breakfast and excellent attentive and helpful staff. The breakfast was excellent. 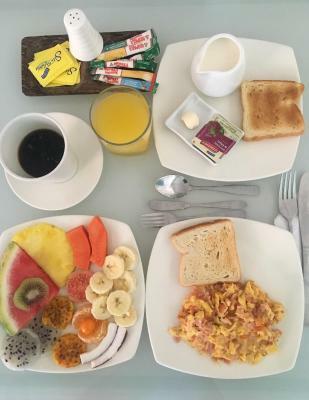 Lovely fresh fruit and then eggs and toast each morning. A well laid out hotel. Gorgeous rooftop terraces, with great views over the plaza and towards the cathedral. VERY good position for exploring the Centro Historico. Best of all were the staff....polite , friendly, and happy to help. Lovely quiet hotel in perfect location...a block from the beach with a lively evening market and restaurants on the pier. Breakfast was good, but coffee could have been better. I think the problem was the milk, as that made the coffee taste funny. The room was great! Everything was very clean and the bed was very comfortable. I also really appreciated the friendliness of the staff.